I have always loved reading and that feeling of escaping into a different life so much different to my own, and through every story seeing things in a different perspective. I love discovering new authors, stories and styles of writing, however, like with anything I do have a couple of favourite authors whose every book I read without question... Paige Toon's being one of those. Ever since first reading Lucy in the Sky I have been captivated by Paige Toon's books and get excited every time she announces a new release. Her stories are always funny, heartwarming, addictive and also at times a little bit heartbreaking (you'll need a box of tissues for The One We Fell in Love With). I was so excited when I heard about The Last Piece of My Heart and one of the things I also love about her books is that even thought the majority of them are standalone stories, you still get to hear about previous characters in different books and we first got a small glimpse into the protagonist Bridget's life in previous books: The Longest Holiday (Laura's story) and Thirteen Weddings (Bronte's story). After a few too many bad relationships that seemed to always be missing something, Bridget develops a theory that with each relationship you leave a piece of your heart with said person and is inspired to revisit each past boyfriend to ask for the missing piece of her heart back in the hope to finally have a happy + fulfilled relationship and hopes for a book deal from her journey along the way. Stuck with moving on from her past loves and it affecting her present relationship, a book that nobody wants to publish and friends who are all loved up, Bridget finds herself surprisingly accepting a job to ghostwrite the sequel to a best selling book. Sometimes life offers you opportunities outside your comfort zone and accepting them could end up being the best thing that happened to you. After deciding that ghostwriting could open up the publishing world to her, Bridget uproots her life for the summer to move to Cornwall per the request of the deceased author's husband, Charlie. You feel for Bridget when she first arrives in Cornwall, first of all she is camping for the duration of her stay which is out of her comfort zone and would be my own personal idea of hell. Secondly, she's navigating the testy waters of a grieving widow who has pretty much isolated himself, doesn't really talk much and he is trying to raise his infant daughter with very little help. It truly takes a village to take care of a child and Charlie is like a tiny fish in an ocean (a little bit lost). Thirdly, I'm a strong believer that even if you fall head over heels for someone that it shouldn't prevent you from being a good friend but Bridget's friend Marty (also featured in The Longest Holiday) seems to be slight slacking in that department and is too wrapped up in her boyfriend. Despite a few comical campsite scenes, Bridget slowly gets used to life in Cornwall and throws herself into the research for Nicole's sequel. I'm impressed with the professionalism and strength she shows whilst reading Nicole's diaries and notes, it's a strange situation to be in and eventually does find her footing. Both Bridget and Charlie are both a little bit lost and I like that they both bring each other back to life + begin to heal from past wounds. Bridget begins for the first time to build a life for herself somewhere and when it's time for her to go back to her life in London she isn't ready or sure what the future holds anymore. Bridget is a hilarious character with the slight tendency to put her foot in her mouth but has a big heart. You see her grow throughout the story and come to understand her decisions for hastily ending so many relationships, I was rooting for her to get a happy ending and Paige did not disappoint. I really hope we see a brief glimpse of Bridget in some of her future books! Now let's talk about Charlie. He tragically lost his wife a couple of weeks after their daughter, Alice, was born and is trying to be the best dad he could be. He seemed so serious and detached at the beginning of the book, which is completely understandable given what he went through and he is slowly trying to piece everything back together. However, it is still so nice when you finally get to see him more comfortable and see his comical side, especially with his brother Adam. Charlie and Adam's passages were hilarious and I really hope Paige Toon decides to give Adam his own leading lady + story. 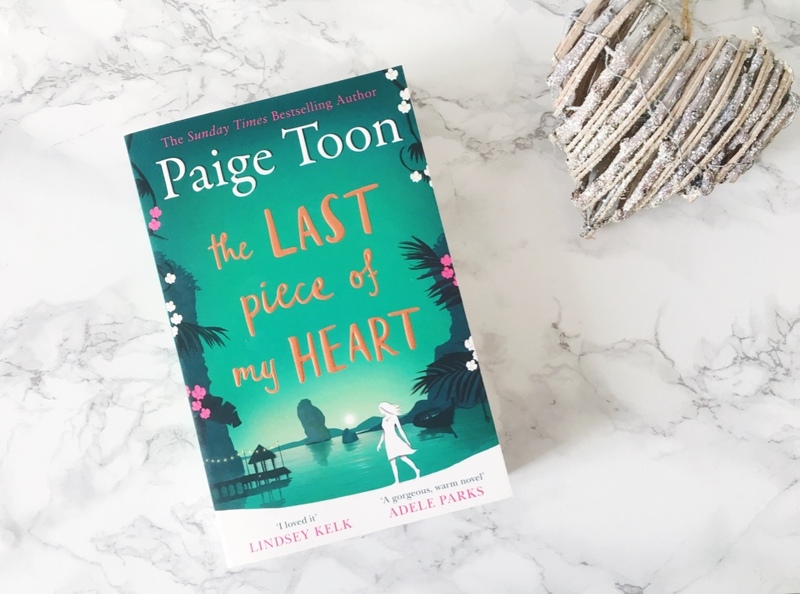 The Last Piece Of My Heart is by far Paige Toon's best book and boy did it pull on my heartstrings, I was pretty much crying throughout the couple of last chapters. The book is beautifully written, it tells a tale of love and loss, which Paige navigates perfectly maintaining a balance of lightheartedness and emotional depth. Grief never really goes away and healing is a long process that is never easy, I liked that Paige showed those little breakdowns along the way that end up slowly putting you back together. I can't wait to see what Paige has in store next and look forward to lots of new stories.